identify sustainable landscaping gardening native plants I Can See Nature! Why use native plants in landscaping? do not damage the local environment, ︎ economy or ⚕ human health. More ︎ songbirds, ︎ pollinators, and desirable animals. You can start very small, and if it works well, expand a bit more next year. May break up problem soils—see diagram above or at right—look at the difference in root depth! Reduced ♒︎ water use after the first year—see diagram above or at right—look at the difference in root depth. Less maintenance after the first few years—prairies take a lot of work to establish. A way to reconnect with your local area. The effects of replacing exotic landscaping with natives are dramatic. For a few years, we have seen an increase in the number of butterflies and ︎ birds in our yard. I expected that—my wife (with some ︎ muscle from me) had been slowly replacing some of our plants with natives. Nothing radical, but if a non-native died or was doing poorly, we replaced it with a native. Part of our lawn morphed into a small prairie. Some plants got moved. One day, I realized it had been three years since we had put out traps for those big green hard flying Japanese beetle Popillia japonica. Weird. I looked around, and saw that we had crossed some threshold, maybe from 30% natives to 50% natives, and we no longer had any issues with the annoying green bug. Apparently, you don't need perfection to restore some balance to your local ecosystem. And my wife recalls that during the Drought of 2013, our Wild Area was the only part of our yard that didn't suffer. Extraordinary! On a smaller scale, perhaps you have an apartment, with room only for a few pots. Even a single pot containing a native wildflower (in my area, perhaps butterfly milkweed Asclepias tuberosa ) could refresh a tired migrator (in my area, perhaps monarch butterfly Danaus plexippus ), allowing it to reach someone else's yard down the street, and then a larger project—perhaps at a park or school. Small steps can still help! Combining private efforts like the above with public efforts like parks and wildlife sanctuaries, The Half Earth Project seeks to allocate half the area of ︎ our planet for nature's use. I do not yet understand the details, but the concept is intriguing! Steve's actions are supported by the flip-side argument "Redefining Curb Appeal: Homeowners are recognizing the value of replacing front lawns with native plants." National Wildlife Federation. March 30, 2015. Accessed 2018-11-15. See the video above or left, on creating the Forest Garden: integrating local ecology, food production, and our desired lifestyle. For full effect, display the video fullscreen via icons ▶ Play then ⛶ broken-square. In  Canada and  USA, please see this list of native plant societies. In  USA's center and east, attend educational programs and field trips of your local chapter of Wild Ones (a group of native plant enthusiasts) (Facebook). In  USA's New England, attend educational programs and field trips of the New England Wild Flower Society. 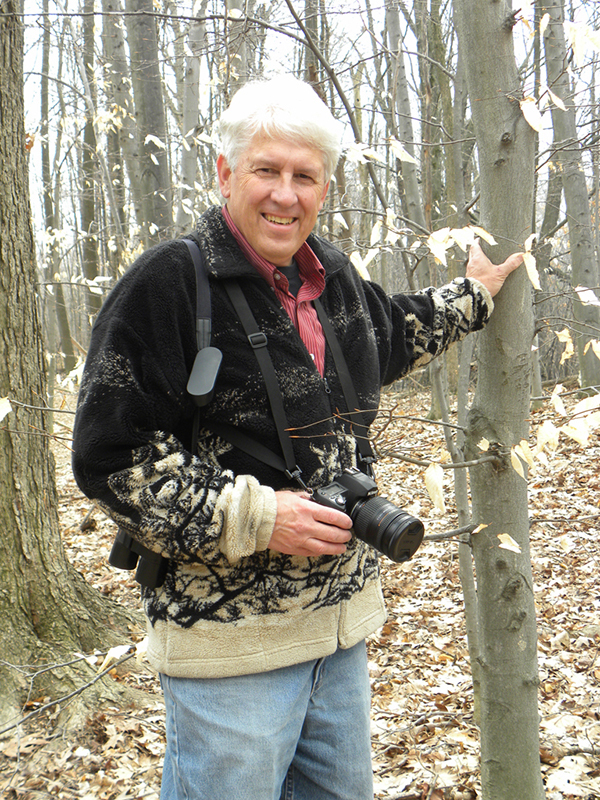 Watch video above or right, of talk Plant Natives by Doug Tallamy in 2015. For full effect, display the video fullscreen via icons ▶ Play then ⛶ broken-square. Or read anything by Doug Tallamy, such as article Gardening for Life (.pdf) or book Bringing Nature Home: How You Can Sustain Wildlife with Native Plants —explains why and how! Awesome Wild Ones handbook Landscaping with Native Plants (.pdf page 2). Look into film Hometown Habitat by Catherine Zimmerman—the best explanation I have seen! Trailer and 37-min interview with trailer at end (for full effect, display the video fullscreen via icons ▶ Play then ⛶ broken-square). Film review. The film itself (check groups above for group showings). Listen to the native plant podcast. Listen to podcasts, view videos, or read articles at EcoBeneficial! with Kim Eierman. Thanks for the tip, Amy! In  Canada and  USA, for recommendations on which species to plant, please see the Lady Bird Johnson Wildflower Center's special collections. Read about rain garden (and prairie) site selection, design, construction and maintenance (.pdf). 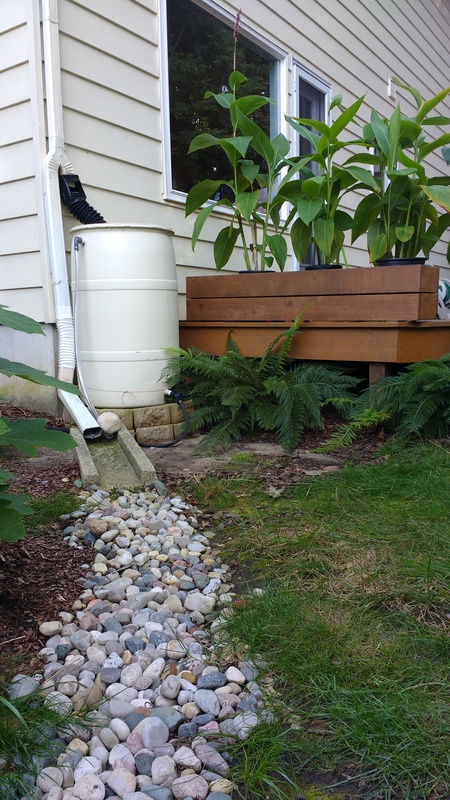 Read about Plant Hardiness Zones vs. Ecoregions and lots of other articles from Habitat Network/Yardmap/Cornell Lab of Ornithology. Questions to ask—a Natural Areas Site Analysis Guide (.pdf). Learn more buttons at bottom of this page. 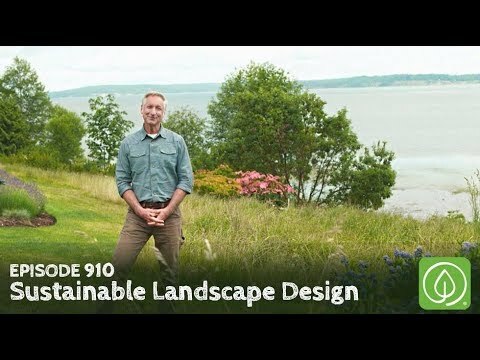 See the video above or left, on sustainable landscape design, from Growing A Greener World. For full effect, display the video fullscreen via icons ▶ Play then ⛶ broken-square. indirectly (by feeding local insects, that will then feed your desired animals or their young). ︎ Some people plan their landscaping to enhance ecosystem diversity and complexity. Canopy trees layer, consisting of original mature trees. Please leave old dying and dead trees standing, to provide food and nesting space for woodpeckers and other ︎ birds and ︎︎︎︎ animals. Small trees layer, forming the "middle story" of the woodland plant community. Native examples in North America. Shrub layer of bushes. This author's family removed a lot of this in our backyard, to make room for the other layers. ◦ Annuals. Easiest to move around and play with. ◦ Biennials. Can move around. Ground cover layer of plants that spread horizontally. Rhizosphere or underground layer of plants grown for their roots and tubers. Vertical layer of vines and climbers. Master them. ︎ Fungi kingdom Fungi. You need good soil—soil that is alive! Nitrogen fixers, somewhere in the above mix. 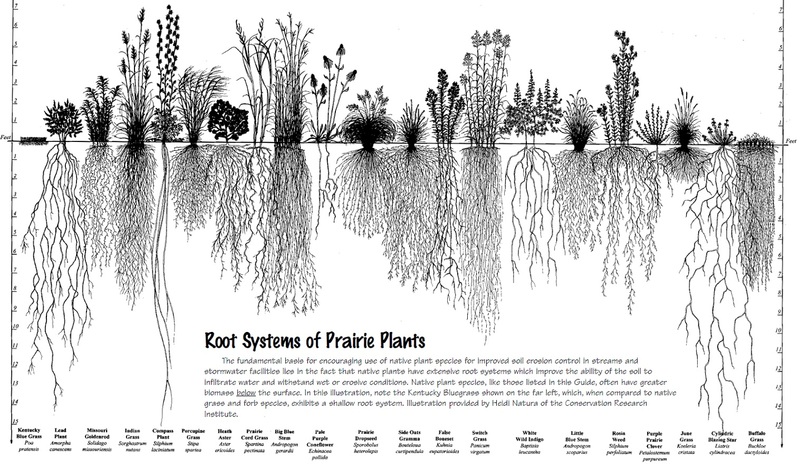 Rain garden (and prairie) site selection, design,  construction and maintenance (.pdf). Begin with as much biodiversity as you can fit or afford. If a plant in your yard isn't doing anything for you (particularly if not providing any ecosystem services), get rid of it. If possible, identify a replacement ahead of time. If a plant isn't happy where it is in your yard, move it. If you need a new plant, think about what you want there. Consider a native. I am now less willing to fuss. If planning for public lands in Michigan's town of Grand Rapids, see the Grand Rapids Approved Tree List. 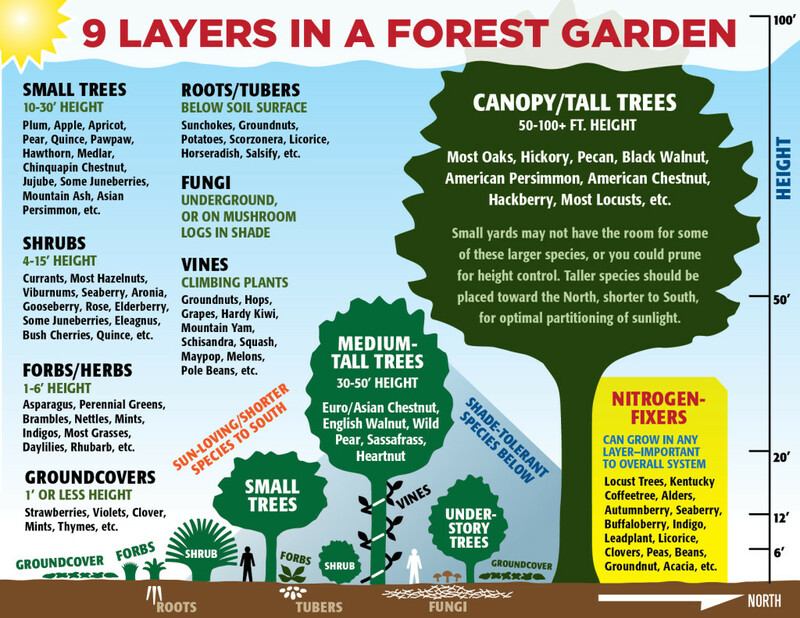 Lots of links on tree selection and maintenance! See the interactive map Michigan Circa 1800 Presettlement Vegetation Cover > zoom in and pan > click on your site > scroll down a bit and read your natural community from Attribute=COVERTYPE. For example, we found that our favorite site is Oak Opening, but near W Oak/Hickory. (A) See the gorgeous Vegetation circa 1800 maps from Michigan Natural Features Inventory MNFI (.pdf) > yourCounty > zoom in and pan. Awesome. ◦ where your site is within the section. ◦ your county's GIS ( Kent Co > turn on Layer=PLSS Sections) ( Montcalm Co > Parcel Viewer) ( Ottawa Co ). For example, we found that our favorite site is in section 32, near the middle E-W, but 90% up N-S.
(C) Go back to the MNFI map in (A), and read off your site's natural community! For example, that puts our pre-settlement vegetation right on the edge of two colors. From the Legend, these two colors seem to map to mixed-oak savanna or pine barren; and oak-hickory forest or beech-sugar maple forest. ◦ If you cannot tell which exact colors are yours, ask your favorite graphic artist or webmaster to use a "color-picker" tool on the areas near your site, and on possible values in the Legend. For example, doing this, we found that our favorite site is on the edge of mixed-oak savanna and oak-hickory forest. In Michigan, you can key out your local natural community. Scroll down to see information on its soils, vegetation (rare and otherwise), animals (rare and otherwise), and more. In  USA, USGS land cover maps > yourState > yourCounty > zoom in and pan and adjust opacity slider. For example, doing this, we found that our favorite site's current use is Developed & Other Human Use, right next to Forest & Woodland. That describes pretty well our site, which backs up to a forest. In Michigan, you can use a list of Michigan natural communities. Or a Search engine such as mixed-oak savanna and oak-hickory forest. In North America, to help ︎ pollinators, ︎︎ Trees for Bees recommends planting native big-leaf maple Acer macrophyllum, hardy catalpa Catalpa speciosa, eastern redbud Cercis canadensis, flowering dogwood Cornus florida, ︎ tulip tree Liriodendron tulipifera, southern crabapple Malus angustifolia, staghorn sumac Rhus typhina and ◼ black willow Salix nigra. Also in North America, the Pollinator Partnership offers recommendations for Selecting Plants for ︎ Pollinators. In  USA, Audubon's recommendations of ︎ bird-friendly butterfly-friendly native plants > your zipcode > button Search. Michigan Native Plants for ︎ Bird-Friendly Landscapes (.pdf). Bloom dates for native perennial beneficial-insect-attracting plants (Michigan) (.pdf page 58) bloom dates by month (Missouri) (.pdf) bloom dates by plant name (Missouri) (.pdf). In North America's Midwest, native examples of small trees forming the "middle story" of the woodland plant community include American hornbeam / ironwood Carpinus caroliniana, dogwood genus Cornus, American witch-hazel Hamamelis virginiana and American hophornbeam / ironwood Ostrya virginiana. The Right Native Plants in the Right Landscape Means Fewer Allergies (.pdf). 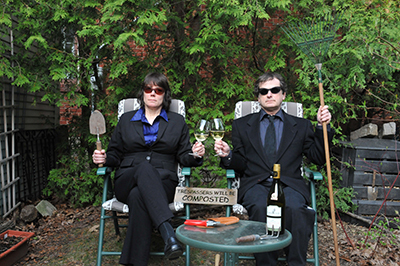 In West Michigan near Grand Rapids, please see a designer in the Native Plant Guild. Contact your local chapter of Wild Ones (a group of native plant enthusiasts) (Facebook). See the Lady Bird Johnson Wildflower Center's National Suppliers Directory > your zipcode > button go. This author recommends you get plants and seeds that are truly native to your region / ecosystem / habitat, and avoid nativar cultivated varieties. Nativars generally do not share the same genetics, reproduction nor ecological functions as their parent stock. and avoid clonal , mutant or horticulturally-enhanced varieties, with single-quotes ' ' or trademark ™ somewhere in the name, such as Drummond's red maple Acer rubrum 'drummondii'. Wild Ones Guidelines for Selecting Native Plants: The Importance of Local Ecotype (.pdf). Nativars: Where do they fit in? (.pdf pages 1,4,5). ︎ "How effective are nativars?" interview with Doug Tallamy on radio show/podcast A Way to Garden.com of 2018-05-28. This author also recommends you get plants and seeds that are not treated with neonicotinoid neonic insecticides. I read that it could be months before your plants are visited by pollinators, or can provide food for your local birds. Seeds from these plants are probably OK.
No single-quotes ' ' nor trademark ™. Not treated with neonicotinoid neonic insecticides. In California's San Francisco area, please see SF Plant Finder Local Plant Nurseries. In American Southwest, please see Native Seeds/SEARCH. In Texas (especially central Texas), please see the Lady Bird Johnson Wildflower Center's special collections. In Southern Ontario (near Toronto), please see North American Native Plant Society or the Local Scoop. In New England, please see the native plant list maintained by the New England Wild Flower Society. ◦ your local chapter of Wild Ones (a group of native plant enthusiasts) (Facebook). ◦ Aerulean's list of butterfly-friendly plant and seed suppliers. In  Canada and  USA, please see North American Native Plant Society. In West Michigan near Allegan County: March last-Friday Allegan Conservation District Tree Seedling Sale. In West Michigan near Kalamazoo County: September 3rd-Sunday Wild Ones Kalamazoo Area Chapter annual plant exchange. In West Michigan near Kent County and Grand Rapids. In West Michigan near Montcalm County: June 1st-Saturday/Sunday Montcalm Area Master Gardener Association's annual plant sale. In West Michigan near Ottawa County: late-April/early-May Saturday/Wednesday OttawaCD native plant sale. In Mid-Michigan near Lansing: anytime, or September 1st and 2nd Saturday Wild Ones Red Cedar Chapter Native Michigan Plant Sale, and lists of mid-Michigan native plant sales and native plant nurseries. In Southeast Michigan near Oakland County: June 1st-Saturday North Oakland Headwaters Land Conservancy (NOHLC) Annual Native Plant Sale. Michigan native plant vendors (.pdf). Michigan Native Plant Producers Association MNPPA. Bloom dates for native perennial beneficial-insect-attracting plants (.pdf page 58) bloom dates by month (Missouri) (.pdf) bloom dates by plant name (Missouri) (.pdf). Year-round: A grower in the Native Plant Guild. March 3rd-Saturday Grand Rapids ︎︎ Community Seed Exchange. April (2nd or) 3rd-Wednesday KentCo/MSU Extension GIG bare-root plant and bulb sale, and class (order by—see below for pickup and class). April 3rd-Thursday KentCD native tree and shrub sale—Spring (order by—see below for pickup). April (3rd or) 4th-Saturday KentCo/MSU Extension GIG bare-root plant and bulb sale, and class (pick up orders, and class). Calvin BIC native plants sale (trees, shrubs, flowers and grasses). May 4th-Saturday KentCD native wildflowers, forbs, grasses and sedges sale (pick up orders, or browse 'n buy). June 3rd-Friday/Saturday KentCo/MSU Extension plant sale. July 3rd-Monday Wild Ones River City-Grand Rapids Area Chapter native plant sale and pollinator garden tour (on Facebook). August 1st-Wednesday KentCD native tree and shrub sale—Fall (order form posted—order by below). September 2nd-Thursday KentCD native tree and shrub sale—Fall (order by—see below for pickup). October 2nd-Saturday KentCD native tree and shrub sale—Fall (pick up orders, or browse 'n buy). In West Michigan near Grand Rapids, please see a landscaper/restorer in the Native Plant Guild. The ︎ prescribed fire/controlled burn plan for my own area is  under construction. 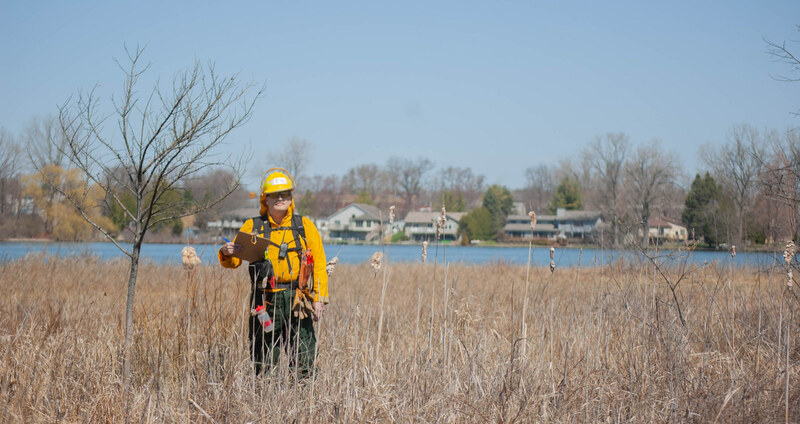 Until published, please see ︎ Prescribed burns ignite Michigan wildlife habitat growth and ︎ prescribed burn video from TNC. ︎ prescribed burn videos. 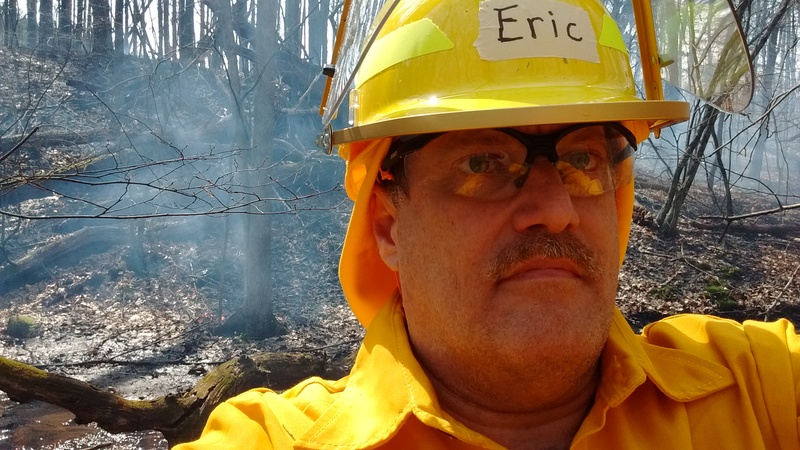 If you are still serious, contact your local agencies, and study applicable parts of NWCG training courses S-130 ︎ Firefighter Training and S-190 ︎ Introduction to Wildland Fire Behavior and S-212 ︎ Wildland Fire Chain Saws student handbook (.pdf). --I Can See Nature! web natives.html v1.0.4.6 2019-03-23, copyright © 2017-2019 by I Can See Nature, LLC.